Day 1 – Arrive in Dublin, Ireland. Check into your hotel. 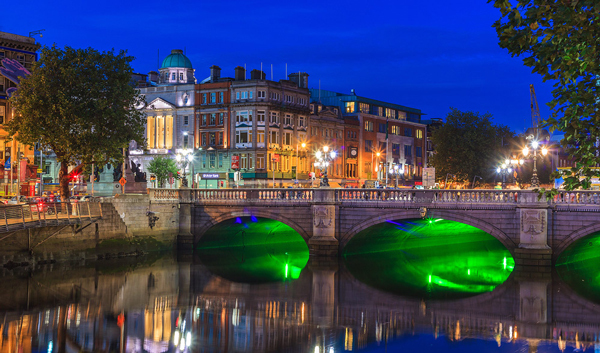 In the afternoon, there is free time to rest or explore the lively Irish capital. This evening, meet your Tour Director and traveling companions for dinner at the hotel. Day 2 – Dublin. After a hearty Irish breakfast, a morning orientation of the “Fair City” starts off with an orientation drive along statue-lined O’Connell Street. Then, admire elegant Georgian squares, St. Patrick’s Cathedral, and famous Trinity College. The afternoon is at leisure or you could take the optional excursion to the Wicklow Mountains and Glendalough, the early Christian monastic settlement founded by St. Kevin in the 6th century. This evening, why not join a fun optional Irish cabaret evening with dance, song, and laughter? Day 3 – Dublin – Galway – Cliffs of Moher – Ennis. 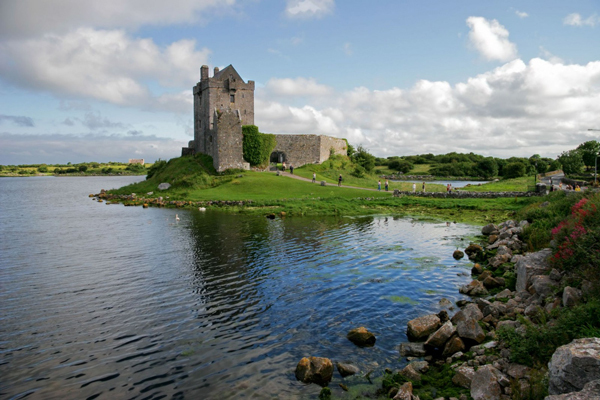 Take the road to Galway this morning, a popular seaside destination and a buzzing cosmopolitan center with cobblestone streets, colorful shops, and a busy cafe and bar culture. Cross the limestone plateau of The Burren to visit the spectacular 668-foot CLIFFS OF MOHER. Tonight, you have a chance to attend an optional medieval banquet at Knappogue Castle. Day 4 – Ennis – Adare – Ring of Kerry – Killarney. 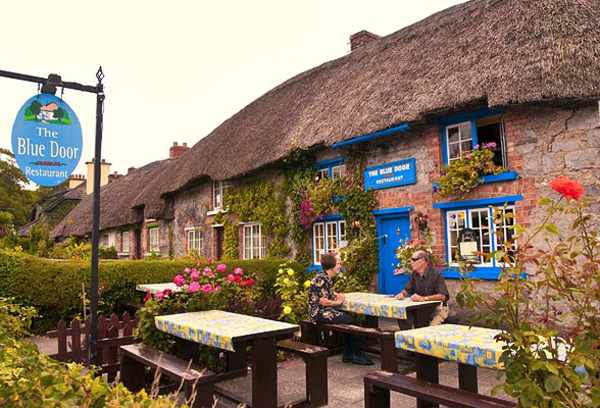 Stop for photos in Adare, a village known for its prize-winning thatched cottages. At Killorglin, join the road known as the “RING OF KERRY” for a 100-mile coastal panoramic drive: sparkling seascapes, mountains dotted with brightly colored farmhouses, winding lanes bordered with subtropical vegetation, and spectacular views of the Lakes of Killarney from Ladies View. Before dinner, you might want to join an optional pub tour. Day 5 – Killarney – Blarney – Cashel – Dublin. 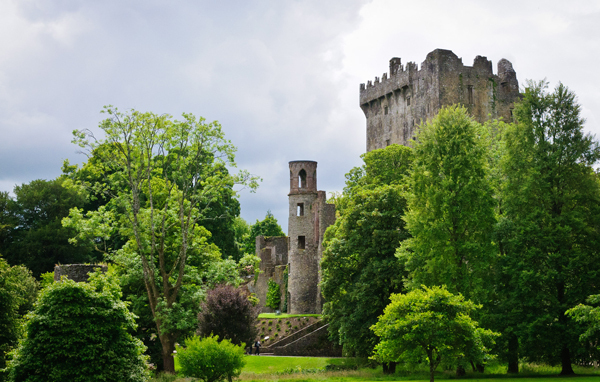 More scenic splendor as you head over the Kerry Mountains into County Cork and to Blarney, famous for its Stone of Eloquence, with time at your leisure to see the castle and shop for Irish crafts and handmade crystal. After lunch, stop at the Rock of Cashel, where St. Patrick preached. Back in Dublin tonight, celebrate the success of your tour with an optional dinner evening at the Guinness Storehouse. Day 6 – Dublin. Your vacation ends with breakfast this morning.